With summer ending and the beginning of the holiday season around the corner, Sprite is setting the mood by spreading some “berry” cheer. Back by popular demand, Sprite Cranberry and Sprite Cranberry ZeroTM return to offer fans a burst of delicious cranberry flavor for the holidays. Sprite Cranberry and Sprite Cranberry Zero launched last year for a limited time-offering a refreshing blend of traditional Sprite and a splash of sweet and tart cranberry notes. The tasty flavor and its zero calorie formula are back to sprinkle a little berry goodness during those special end-of-summer moments and upcoming holiday festivities. Available in late September, the limited edition flavor will appear on store shelves through the end of the year. 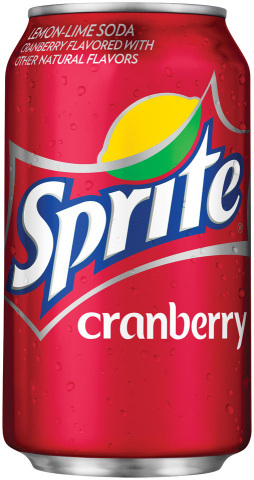 Sprite Cranberry and Sprite Cranberry Zero will be available in Fridge Packs (12-ounce cans), 2-liter bottles and 20-ounce bottles (Sprite Cranberry only). The popular flavor will be sold in supermarkets, mass merchandisers, convenience and drug stores nationwide. More information will be available on www.Sprite.com and www.Facebook.com/Sprite. The Coca-Cola Company (NYSE:KO) is the world’s largest beverage company, refreshing consumers with more than 500 sparkling and still brands. Led by Coca-Cola, one of the world’s most valuable and recognizable brands, our Company’s portfolio features 17 billion-dollar brands including Diet Coke, Fanta, Sprite, Coca-Cola Zero, vitaminwater, POWERADE, Minute Maid, Simply, Georgia and Del Valle. Globally, we are the No. 1 provider of sparkling beverages, ready-to-drink coffees, and juices and juice drinks. Through the world’s largest beverage distribution system, consumers in more than 200 countries enjoy our beverages at a rate of 1.9 billion servings a day. With an enduring commitment to building sustainable communities, our Company is focused on initiatives that reduce our environmental footprint, support active, healthy living, create a safe, inclusive work environment for our associates, and enhance the economic development of the communities where we operate. Together with our bottling partners, we rank among the world’s top 10 private employers with more than 700,000 system associates. For more information, visit Coca-Cola Journey at www.coca-colacompany.com, follow us on Twitter at twitter.com/CocaColaCo, visit our blog, Coca-Cola Unbottled, at www.coca-colablog.com or find us on LinkedIn at www.linkedin.com/company/the-coca-cola-company.